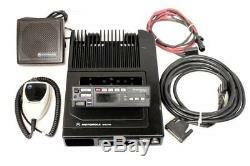 Motorola Astro Spectra VHF 110 Watts 128 Ch 146-174 Mhz W5 HAM. 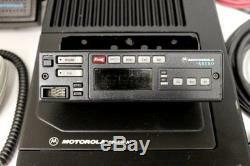 Motorola Astro Spectra W5 VHF - model number T04KLF9PW5AN. These are 110 watt, 128 channel radios with a band split of 146-174. These units can program into the ham band with normal software no modifications required. These units are capable of both APCO 25 (P25) and analog operation, and MDC signaling. These will also do all of the 2013 narrow band requirements. We will program (1-16) for free. Radio comes complete with W5 head, palm mic, control cable, accessory connector, external speaker, bracket and power cable(No Mounting Tray). Options Installed on this Flashcode. We will only program up to 16 channels and do not program for trunking systems. The item "Motorola Astro Spectra VHF 110 Watts 128 Ch 146-174 Mhz W5 HAM" is in sale since Thursday, July 27, 2017. This item is in the category "Business & Industrial\Facility Maintenance & Safety\Surveillance & Alarm Equipment\Two-Way Radios". The seller is "erac1" and is located in Parker, CO. This item can be shipped to United States, Canada, Australia.